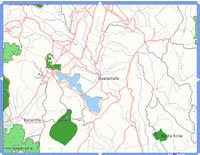 GIS Technology is going to be used for Carbon Accounting and Tropical Forest Management in Guyana. See the ESRI News Release. Ten full scholarships for non-EU students are available under the Erasmus Mundus programme for an MSc in Geospatial Technologies, taught in English, at Münster University (Germany), University of King Jaume I (Spain) and the New University of Lisbon (Portugal). UN-SPIDER and the Space Generation Advisory Council in support of the UN Programme for Space Applications (SGAC), calls for candidates from Caribbean Region countries between the ages of 18–35 to submit a poster on the topic of "Case Study on the use of Space–based information for Disaster Management in the Caribbean". The lucky winner will be invited to the 4th Caribbean Conference on Comprehensive Disaster Management from the 7-11 of December, 2009 in Montego Bay, Jamaica. Travel costs, daily subsistence allowance and cost of printing poster will be covered The deadline is 15 Nov 2009. With the launch of WorldView-2, the newest high resolution sensor, today Oct 8, 2009, GIS practitioners now have several choices for commercial half-metre imagery. WorldView-2 will acquire 46cm (panchromatic) and 1.84m (multispectral) imagery. 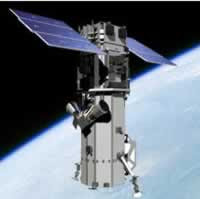 The GeoEye-1 sensor, launched on Sep 6, 2008, provides 41cm (panchromatic) and 1.65m (multispectral). And WorldView-1 launched on Sep 18, 2007 provides 50cm imagery. One can actually see/ interpret people on these half-metre images (not faces yet, that's just in Enemy of the State). There's also the "lower" resolution, and more affordable, 1-metre resolution QuickBird and IKONOS imagery suitable for a variety of tasks. Even though the newer sensors can technically provide 41/46cm resolution images, non-US Government orders are limited to 50cm resolution. For customers in the West Indies, the official agents for the satellite companies, GeoEye and DigitalGlobe, are located in Trinidad and Barbados, respectively. Well, there are a few good sources including the US National Hurricane Center (NHC) with decent presentation, useful charts and downloadable GIS data, and the more colourful Weather Underground, but the best visualisation that I've seen recently must be the MSNBC, Bing-powered, Stamen-designed Hurricane Tracker. Belize National Spatial Data Infrastructure (NSDI). As reported in the news and on the GSDI LAC and the GEOSS Caribe mailing lists, Belize's effort to build an NSDI aims to "foster national development by promoting national competitiveness and productivity". That unusual statement puts it well - an SDI isn't just an ideal, it's part of any modern country's infrastructure. Belize has experience with GIS. Its first use of GIS and Remote Sensing was during the late eighties to monitor crop potential and harvesting of Sugar Cane. In the nineties it established a GIS-equipped Land Information Centre (LIC). This 1st NSDI conference was very well attended. About 25 organizations from the public, private, academic and private sectors attended the conference which was held at the San Ignacio Hotel, San Ignacio Town on the 29th & 30th of July. The objective of the conference was to prepare the participants for the development of an implementation plan for the Belize National Spatial Data Infrastructure. The group now intends to complete a draft implementation plan by the end of Oct 2009 and to present it for discussion at the 2nd NSDI Conference already scheduled for the week of the 16th of Nov 2009. The draft plan will address the tangible and intangible components of the SDI ... including policies and procedures, data quality and data documentation standards, and portals and data access options. The ultimate objective is to get the NSDI off the ground and operational in the next 21 months. Good hunting Belize! CARICOM at its recent conference in Guyana has endorsed the Caribbean Challenge within its declaration on climate change and development as outlined below. The Caribbean Challenge was launched at COP 9 of the CBD in 2008 in Bonn and has the following overall goal: Caribbean governments will protect at least 20 percent of their marine and coastal habitats by 2020. The Thirtieth Regular Meeting of the Conference of Heads of Government of the Caribbean Community (CARICOM) was held at the Guyana International Convention Centre, Liliendaal, Greater Georgetown, Guyana from 2-5 July 2009. The President of Guyana, His Excellency Bharrat Jagdeo presided. 2. Gravely concerned that our efforts to promote sustainable development and to achieve the internationally agreed development goals including the Millennium Development Goals (MDGs) are under severe threat from the devastating effects of climate change and sea level rise which has led to increasingly frequent and intense extreme weather events, damage to bio diversity, coral bleaching, coastal erosion, changing precipitation patterns. 3. Emphasising that dangerous climate change is already occurring in all SIDS (Small Islands and Low-lying Coastal Developing States (SIDS) regions including the Caribbean and that many SIDS will cease to exist without urgent, ambitious and decisive action by the international community to reduce global greenhouse gas emissions significantly and to support SIDS in their efforts to adapt to the adverse impacts of climate change, including through the provision of increased levels of financial and technical resources. 1. Our belief that the global response to climate change should be undertaken on the basis of common but differentiated as well as historical responsibility and that it should not compromise the ability of SIDS to pursue Sustainable Development and the sharing of the cost of addressing climate change should be equitable and should not perpetuate poverty. 5. The importance of a common Regional approach to address the threats and challenges of climate change and of the full and effective participation of the Region in the upcoming United Nations Climate Change Conference in Copenhagen, Denmark (COP15), the UN Secretary-General's Climate Change Summit in September 2009 and their preparatory processes. 12. Our further resolve to institute a comprehensive programme of public awareness and education and hereby invite all, partners, organisations and stakeholders to play a full part in promoting a better understanding of climate change and its impacts and in addressing adaptation and mitigation. From the GSDI LAC mailing list. Five (5) scholarships for the MSc program in Geoinformatics (4 semesters, starting October 1, 2009) for nationals of one of the following countries: Argentina, Brazil, Chile, China (P.R. ), Costa Rica, Egypt, India, Indonesia, Malaysia, Mauritius, Mexico, Nigeria, Pakistan, Russia, Saudi Arabia, South Africa, Thailand, Trinidad and Tobago, Turkey and Uruguay. Two (2) partial scholarships for the MSc program in Geospatial Technologies (3 semesters, start September 4, 2009) for nationals of the following countries: Argentina, Brazil, Chile, China (P.R. ), Costa Rica, Egypt, India, Indonesia, Malaysia, Mauritius, Mexico, Nigeria, Pakistan, Russia, Saudi Arabia, South Africa, Thailand, Trinidad and Tobago, Turkey, Uruguay. The scholarships include: tuition waivers, health insurance support, travel costs support including support for one home flight to/from Europe in between. Another year, another hurricane season. Last month, NOAA, predicted a 50% chance of a "normal" 2009 hurricane season. A normal Atlantic hurricane season, 01 Jun - 30 Nov, has 6-14 named storms, 4-8 hurricanes and 1-3 major hurricanes (Category 3 with 111mph winds). 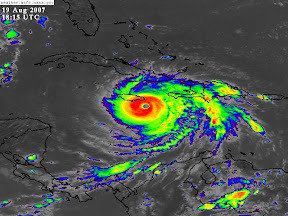 Earlier this month, Colorado State University Department of Atmospheric Science predicted 11 named storms, 5 hurricanes and 2 major hurricanes for 2009. In 2008 CSU had correctly predicted an above average season (we had 16 named storms). One thing about hurricanes - they are pretty big. So even for well-prepared and well-equipped nations, a whack from just one hurricane can often be just too big to handle alone. So, if it does happen, who can we call? CDERA - The Regional focal point for disaster response for english-speaking CARICOM Countries based in Barbados. Not known to have GIS capabilities but sometime in the (near?) future will have a WebEOC (Emergency Operations Centre) built by the US military to "facilitate more effective communication and coordination among the CDERA Coordinating Unit, affected countries and supporting agencies through real time sharing of critical information". SERVIR - A Regional facility based at CATHALAC in Panama with extensive GIS capabilities including a bunch of folks knowlegeable about applying technology. It has a very good bilingual portal and has produced information products in disasters such as maps of the May 2009 earthquake in Honduras. So far, it seems focused mostly on serving the spanish-speaking Central American countries but renders assistance elsewhere too. Disaster Charter - Based in Vienna (I think; somewhat ironically it doesn't make contact information easily available) and provides maps and/or imagery of disaster areas based on a wide range of satellite sensors, but only when "activated" via a single confidential number. This modus operandi seems needed to protect the resources of the contributing space agencies from being accessed will nilly. UNOSAT - This UN agency is based in Geneva and it "[acquires and processes] satellite data to produce and deliver information, analysis and observations to be used by our partners and beneficiaries for relief". Has access to and makes use of the Disaster Charter. OCHA - OCHA has bases in many countries in the Region. It can mobilise a UN Disaster Assessment and Coordination Team (UNDAC) into affected areas and provides "information management tools for use by humanitarian response agencies to assist in planning, response and coordination". OCHA has certainly made use of external mapping skills in responses in the Region and is apparently trying to do more of the same itself. MapAction - A UK-based NGO with sections in Germany, Trinidad and Guyana. It provides a well-trained and equipped rapid mapping cell, on site, helping government and other responders with situation maps. It mobilises in hours and responds to requests by countries, regional disaster focal points or international humanitarian missions; and eventually hands over to in-country skills after a few weeks when the situation stabilises. The most recent mission in the Region was in Haiti at the request of the IFRC where they worked alongside UN OCHA, the Haitian Directorate of Civil Protection (DPC) and others in the emergency caused by the 2008 hurricanes. Does a Spatial Data Infrastructure (SDI) make sense for small countries? After all, an SDI, like any other infrastructure takes financial investment, time and effort to build. And small countries might feel that they don't have the tax dollars to spend on esoteric-sounding "SDI". Karen Richardson and Alan Mills make the case for SDIs in Ascension Island, St. Helena, Rodrigues Island, Montserrat and the Caribbean's smallest country, St. Kitts & Nevis - Small Islands SDI (686KB PDF). According to the US Government Accountability Office (GAO) , "It is uncertain whether the Air Force will be able to acquire new satellites in time to maintain current GPS service without interruption". As you may know, the USAF maintains and controls the Navstar GPS system. The GAO estimates that the full constellation of 24 satellites may fall below the 95% committed/ expected availability in 2010 through 2014, with the probability of a full constellation falling to 80% for 2012. The report and executive summary are available here. So, will the world as we know it come to its Mayan Calendar end, or will the EU's Galileo, China's COMPASS and Russia's GLONASS GPS systems see here an incentive to expand their operations as a global public service? 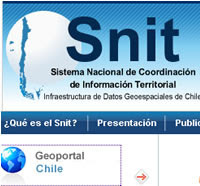 Via the GSDI Mailing List: Guatemala has launched a new Spatial Data Infrastructure (SDI) portal. It's in spanish, and the universal language of spatial data and maps. It was built using Open Source tools and though it has some rough edges, it's a very good start and an excellent development for SDI in the Region. If you like, just for the information, you can read the Home Page in English. Where is the Map Going? Well, pretty interesting places. The power of maps to communicate quickly and well to a very wide audience is a strength of GIS. When distributed (swiftly and conveniently) via the web, this information only increases in value for its timeliness. What's also interesting is the use of online maps to do the reverse as well; i.e. either continually connect to and summarise a variety of sources or allow people in many locations to pool their knowledge (crowd-sourcing) of an issue or event. HealthMap - The global disease alert map, is a free service that "brings together disparate data sources to achieve a unified and comprehensive view of the current global state of infectious diseases and their effect on human and animal health". It's been particularly relevant today with the global alert about swineflu. WikiCrimes - Allows citizens to "share crime information and keep safe". It's not run by the police but by allowing the citizen to map what they know, it compiles and shares useful crime data for use by society - a sort of Neighbourhood Watch online. WikiMapAid - Another crowd-sourcing portal, this time with information about "poverty crises hotspots by capturing data about orphanage programs, drought, food, employment, education and training"... to "[map] solutions to poverty-oriented problems". 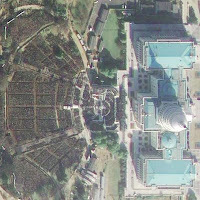 Images from space are fun as well - see/download a copy of the shot from space of what CNN called "The Moment" - the Inauguration of US President Barack Obama: 0.5m resolution GeoEye-1 imagery (270KB JPEG). A better resolution JPEG is also available. Photo courtesy of GeoEye. Costa Rica suffered a Magnitude 6.2 Earthquake on Thurs the 8th of Jan at 19:21 GMT. The University of Costa Rica Seismic and Volcano Observatory (OVSICORI-UNA) is appealing for satellite images of the area to help assess damage. Email Rodrigo del Potro with suggestions. Address: OVSICORI-UNA, 2346-3000 Heredia, Costa Rica. Tel: (+506)25624010 Fax: (+506)22610303. The people of Gaza face a deteriorating humanitarian situation. The UN Office for the Coordination of Humanitarian Affairs and Oxfam have reported on the situation as well. Open Street Map - the Free Wiki World Map - is mapping the country with the aid of volunteers to provide useful maps of the Gaza Strip in the immediate future for use by relief agencies and other people on the ground. And if you are a person who is familiar with Gaza, but not in Gaza presently, and you'd like to participate, go here for guidance. Whilst this may be far from the shores of Latin America and the Caribbean, it's an exemplary demonstration of community-based online mapping and courage.